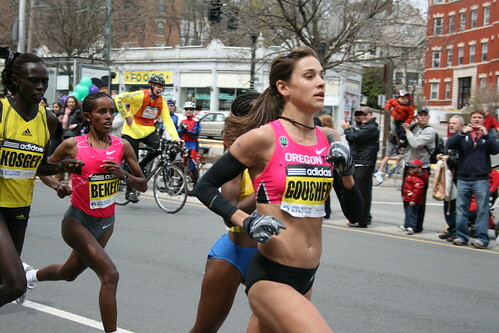 Not that I should be at all surprised, but sheesh...Kara Goucher is a speed demon at the half marathon distance. She didn't even need padding--like those starts at the NYC Marathon in years past or the SkirtChaser 5K where the women have a head start on the men--to be the first person across the finish line at Sunday's Rock 'n' Roll Chicago Half Marathon. If you were lucky enough to be in Grant Park Sunday morning to watch the finish--I missed it unfortunately, cooling off after a debacle of a race at Steelhead (more to come on that one)--you saw Kara Goucher sprint to the finish line in 1:08:05 mere seconds ahead of male overall winner Chad Ware (1:08:24).